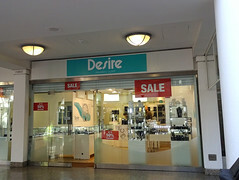 Jewellery shop on the lower level of the Whitgift Centre. It was previously a health/beauty/perfume shop called eCosway photo, but this closed down some time between July and December 2014. The unit was still vacant as of June 2015 photo, January 2016, and May 2016. Some time between May 2016 and April 2017, a jewellers called Desire opened photo. Last edited 2018-08-17 10:10:18 (version 18; diff). List all versions. Page last edited 2018-08-17 10:10:18 (version 18).